Bits & Scraps Of My Life: Happy Early Thanksgiving!! Happy whatever day it is!!!! 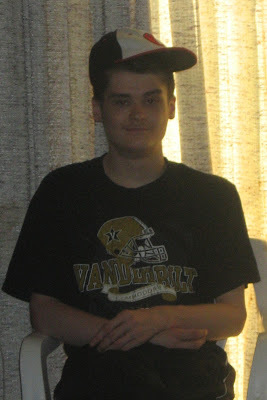 Actually today is my oldest son Matthew's 20th birthday! Jesse thought he would look cute in this hat........lol. Those of you who have followed my blog for a while know that Matthew is Autistic. I hate to keep bringing it up, but I know sometimes when I am telling a story about Matt some might not understand his reactions and most assume when I am talking about one of my kids keeping me up screaming all night I am talking about an itty bitty feller..........and once people find out Matt is 20 and still in high school they kinda raise an eyebrow. I've gotten quite used to the odd looks, trust me!! It doesn't bother me anymore......I realize that most people just don't understand what they can't see. It's no ones fault.....it's just how things are. Now to switch gears a little bit I wanna share another page I created the other night. 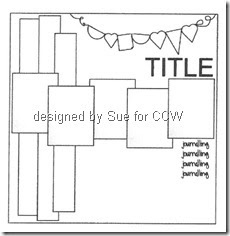 Isn't this sketch from Creative Craft World awesome?? These pix are from Halloween and I used some scraps of Reminiscence Moonshine Crew....I think it turned out super cute!!! Welp.......that's it for me.....I have pies to bake and eggs to devil tonight!! I hope you have a most wonderful Thanksgiving with friends and loved ones!!!! I loveeeeeee your lo! LOVING the candy corn banner!!! And HUGE HAPPY BIRTHDAY to Matt!!!! You know I can relate to the looks with everything Brookie went through with her surgeries... so girl... I feel your pain!! It's never easy :) I hope you all have a wonderful Thanksgiving!!!! I just love what you have done with my sketch - a super page. Thank you for joining in with us at Creative Craft World. What a great fun page, thanks for sharing with us at Creative Craft World. What a gorgeous LO, Happy birthday Matty and Happy thanksgiving too :) hope you all have a lovely time. Thank you for joining in with the scrap map over at CCW. Happy Birthday Mathew - have a fun packed day and year ahead too. Thanks for joining in the scrap map challenge at CCW.